We can guarantee that backpacking with a cat is unlike any other hiking expedition you’ve been on! The addition of your ball of fur when you go hiking or backpacking creates a whole new atmosphere – and along with it, new experiences and challenges. Since exploring with our cat in a backpack, we have discovered a new fun and healthy activity to enjoy together and we want to share what we’ve learned and that same joy with YOU! Here are our best tips for backpacking with a cat you should be aware of before you go adventuring with your feline friend. 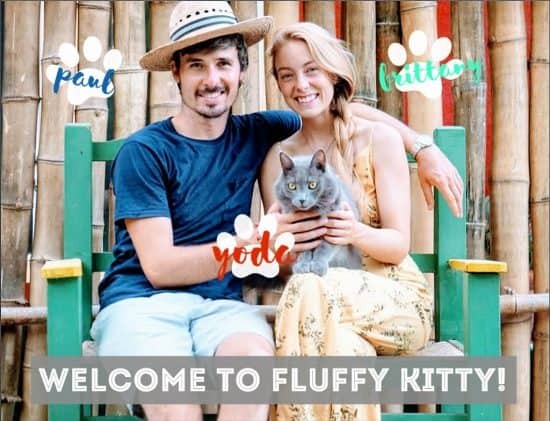 We’ve been backpacking with our cat Yoda mostly since moving to Mexico. Being able to bring Yoda along to sandy beaches and on short hikes in the jungle has just been wild! Backpacking with cats was completely new for us a few months ago, but now we are able to go on backpacking rides with our cat now whenever we want – or when he wants, really! Yoda is super curious about the outdoors, so he loves to ride along in his cat backpack. He loves sniffing the fresh air, watching the birds fly, and chewing on all kinds of grass! 6. Plan Your Trip As Much As Possible! 10. Let Your Cat Out to Stretch! Wait Too Long to Go on Another Backpacking Adventure! 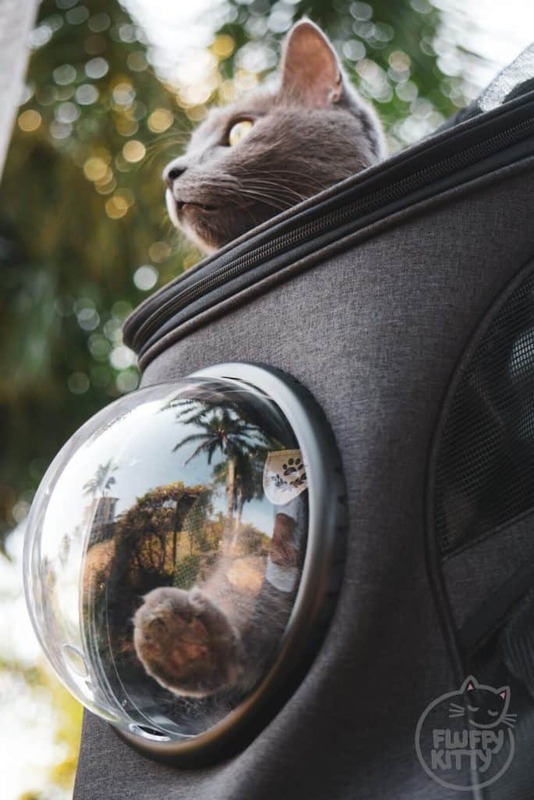 Training your cat to go in a cat backpack might require some time and patience, but it’s worth it! If your cat is completely new to backpacks, let them get familiar with one first. Entice them to lie down in it as a bed, play, and give treats whenever they interact with it. 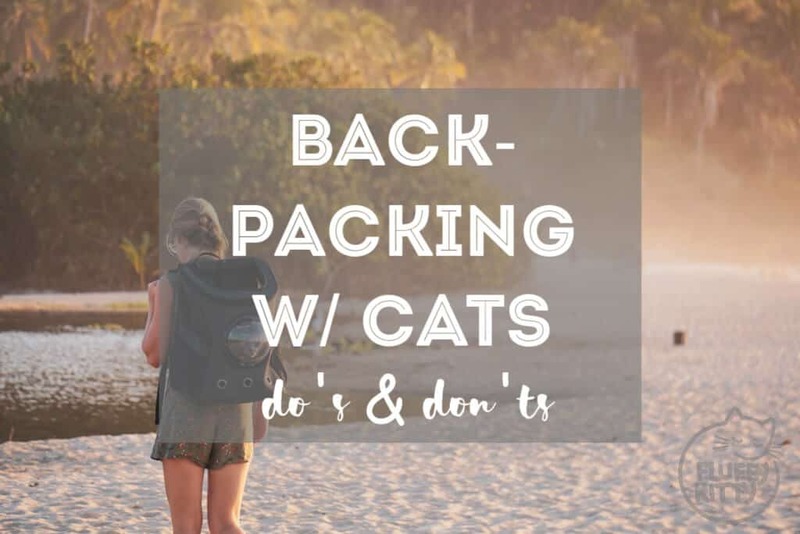 Beyond that, making sure your cat can feel comfortable once the backpack is lifted on your back is really important – as this is what the majority of backpacking with a cat is about! 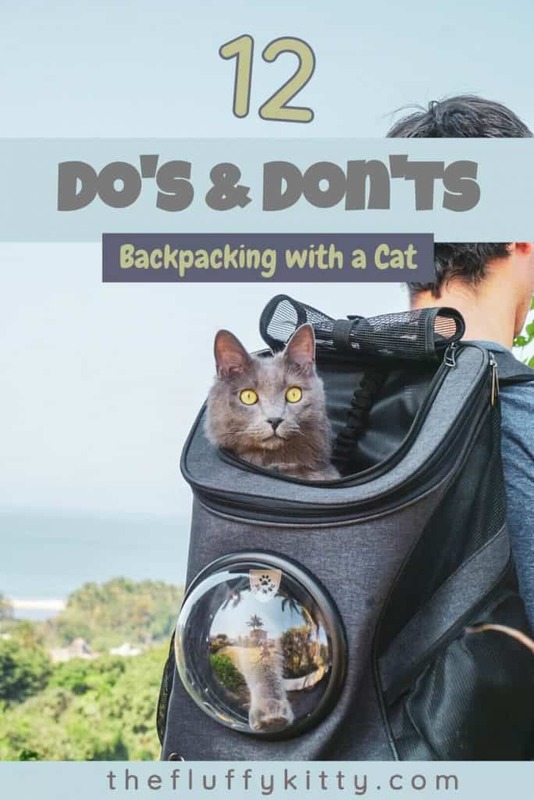 We’ve found it particularly helpful to have two people help train a cat to enjoy riding in a backpack. One person can carry the backpack, while the other person looks after the cat from behind and encourages them with positives cues. If you’re solo, we recommend carrying the backpack on your front side for the first few trips! This way you can keep an eye on your cat. Never try to force and quickly close the backpack on your cat. Doing so might spook your cat more than anything, and they’ll likely try to get out during your whole backpacking trip. Just don’t do it! 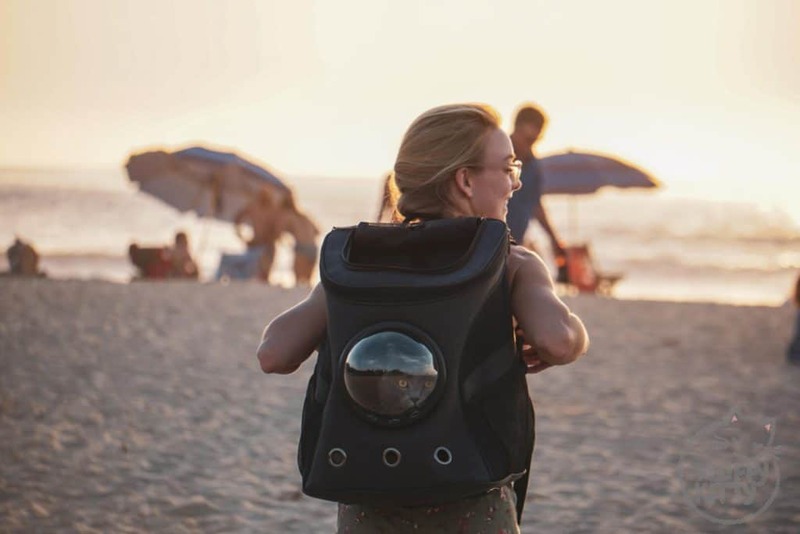 We must include this because, while it may seem obvious, there are dozens of cat backpacks now on the market that it can be hard to choose a really good one. Cat backpacks all vary in size and style, but we recommend investing in one with high-quality material, several breathable holes and/or mesh, an easy top-down or front access, and a backpack that is large and spacious. Above all, consider the size and comfort of your cat! It can be tempting to buy the “cuter” cat backpack, but chances are it’s not as practical or sturdy as some others. Remember, a cat backpack is a long-term investment. If there is a backpack that’s $10, $20, or even $30 less vs. another one, make sure to compare the two and really analyze the differences in quality. Just like with harness and leash training, you’ll want to practice having your cat ride in the backpack at home before heading outdoors. Once your cat is comfortable enough to ride around from room to room in your home, chances are they are ready for the next big step: Going outside. During your in-home training, try to walk and behave naturally – make pretend hiking movements, stops, turns, and so on. Doing so will train your cat to adapt to all of your types of movements (and not just simply walking). A big mistake to make on your first cat backpacking trip is to overdo the whole thing. If the trip is too long, if the weather is too hot, or if your cat isn’t feeling secure, all of your progress will start to dwindle. Slowly but surely. Always begin with short trips before endeavoring to go on long walks or hikes with your cat in the backpack. You might badly want to try out that new park or hike up to a magnificent vista with your feline friend. But it’s important to only go to safe and quiet locations at first. Save the big stuff for later, once your cat is a pro at backpacking. Busy streets, parks, or trails can just have “too much going on” for your cat. Of course, this depends on each cat’s personality. But generally speaking, cats will scare much easier when there are too many people, too many cars, dogs, or noise, and so on. Remember to take it slowly and you’ll set yourself (and your cat) up for success! 5. DO Bring Extra Water, Treats, Harness+Leash, Etc. Always bring an extra bottle of water just for your cat! That’s right. Keeping your feline cool and hydrated is an important part of backpacking with a cat. Cats sweat through their paws, so they don’t physically show when they’re already overheating. A panting cat is really exhausted and needs to cool down asap! Bringing a goody bag of your cat’s favorite treats is a wise decision. You should always give a treat for positive behavior! If you already have attached your cat’s harness and leash, great! But if your cat will be in the backpack without it, it’s always a good idea to just bring it. You’ll need a harness to take your cat out for breaks anyway. While most cats can go several hours between litter box trips, some cats need to urinate or go potty more frequently. Bringing a collapsible or travel litter box can help ease your cat and make them more comfortable for their backpack ride. Asking them to just hold on to their pee isn’t so nice! Especially bring one for longer trips or if your cat doesn’t feel secure going outside in nature. Plan the weather, plan the itinerary, plan your breaks, plan, plan, plan! Planning your backpacking trip with your cat will help minimize trouble. Of course, you can’t control the weather, but making sure to go at optimal times of the day when it’s not too hot or windy will result in an overall more enjoyable experience backpacking with your cat. While you might have a cat exploring warrior on your hands, try not to overjudge your cat’s abilities and endurance. Just bouncing around in a backpack can get tiring for your cat, so always consider their comfort. On the other paw, don’t underestimate your cat’s abilities either. Some cats are more curious and agile; they’ll love to hop out and explore every now and then. Some cats might just like to take in the views from the safety of the backpack. And that’s ok! Make sure to take breaks at least once every 30 minutes or so when backpacking with a cat! Cats aren’t used to wobbling around in a closed space for long periods of time. Let them rest. It’ll be good for both of you! Breaks or short pauses are the perfect time to give your cat some water, a treat, or a chance to use the litter box (if you brought one). 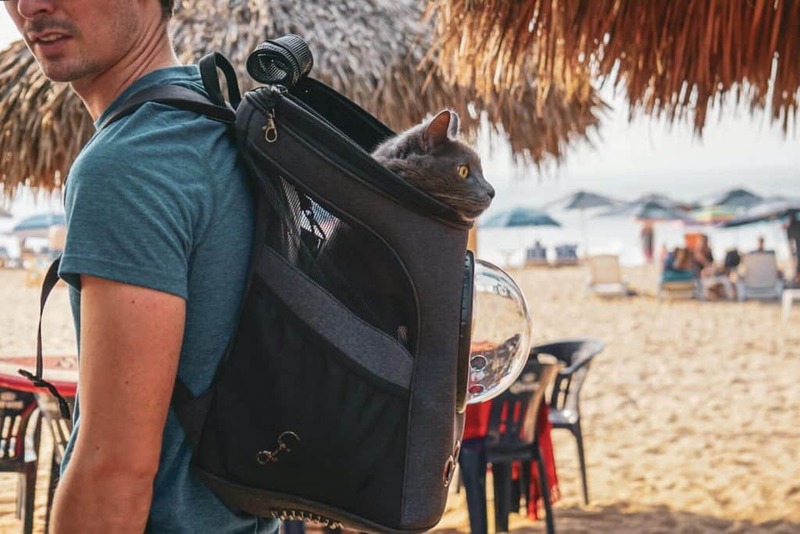 While some nervousness is normal for cats riding in new places in a backpack, know that it’s not normal for your cat to be constantly meowing or crying. Meowing isn’t a sign your cat’s enjoying their backpack ride, so make sure to attend to your cat’s needs in case they do start to meow. They might be trying to tell you their too hot, they can’t see well enough, they need to rest, get down, or simply they just want to go home! Don’t think that they”ll just “get over it”, because that will do way more harm than good. Backpacking with cats comes with new challenges. You’ve got to be aware of your surroundings more than you if you weren’t out exploring with a cat. Weather, temperature, space, pace, location, wildlife, dogs, humans, water… All of these things you should take into consideration when out backpacking with your cat. If you’re unsure whether a park or trail allows off-leash dogs, it’s better to keep your feline in the backpack. Even if your cat is okay being around new dogs, know that not all dogs will be so friendly to your cat. It’s better to let your cat explore on their harness and leash in areas you’re familiar with. Cat trackers – GPS or otherwise – are great ways to securely keep tabs on your adventure cat! Just in case of a backpack or harness malfunction and your cat escapes, you don’t want them bolting off into the great unknown with no way of finding them back. Make sure to at least have some sort of identification tag on your cat, in the event of a mishap! It’s better to be safe than sorry, as they say. You never know what could make your cat run off. Accidents do happen, no matter how much we plan that they don’t. Just be smart about backpacking with a cat and know there’s always a risk when you go out exploring with your feline. Whether you simply hold your cat in your arms or let them down to walk on the ground for a few minutes, it’s important to let the cat out of the bag (literally!) and give them the chance to stretch. Cat backpacks can be large and spacious without being super roomy. While your cat may lie down comfortably in their backpack, they’re probably not able to stretch out their toebeans fully. Letting your cat explore and stretch will invigorate their senses, anyway. It’s a win-win for everybody! DON’T Forget About Wildlife, Fleas, Toxic Plants, Etc. If you do let your cat explore a little on their harness and leash while out backpacking, make sure to consider wildlife in the area. Not just for your safety, but for the critters safety, too! Along those lines, think about providing your cat with an effective flea and tick repellent, like the Seresto flea collar. We’ve been using Seresto for years now and have awesome success at keeping fleas at bay whenever Yoda is out exploring. Lastly, don’t let your cat just chew on any type of plant. Grass is ok – but make sure you know your stuff because many plants are toxic to cats that you might not know about. 11. DO Give Rewards Along the Way, Especially After! In the midst of all the fun you’re having backpacking with your cat, don’t forget to reward them with plenty of treats! A backpacking cat is not your ordinary feline – make sure to treat them like royalty! Associating the backpack with positive rewards is key to not only training cats to enjoy the backpack but maintaining that enjoyment for future backpack trips. DON’T Overfeed Your Cat Just Before the Trip – Backpacking Can Get Bumpy! Definitely avoid overfeeding your cat right before you go out hiking. You might think it’s a good idea initially, but as you’ll see, cats in backpacks will have a little bounce. Overfeeding just might make them feel nauseous. An amateur mistake most of us will make after our first backpack trip is not cleaning our gear. 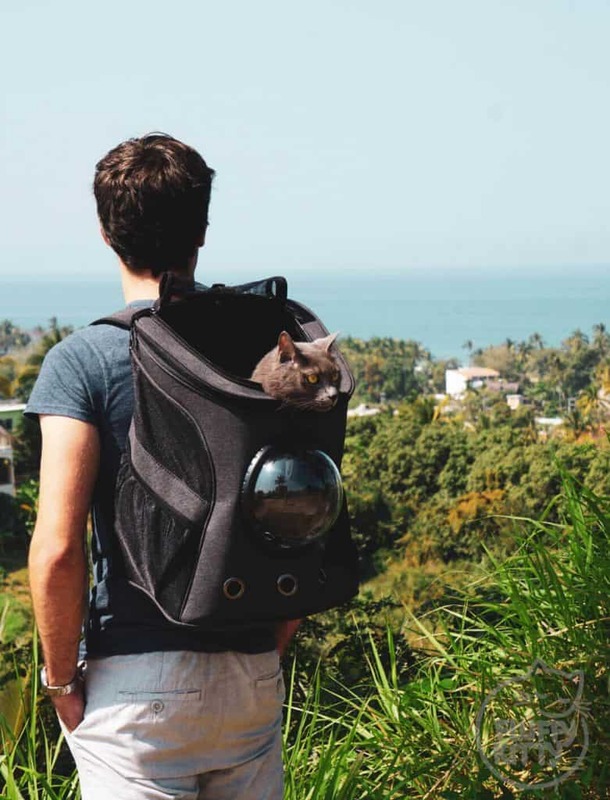 You just invested in this awesome cat backpack, make sure to take care of it! After hiking twice with Yoda, we realized how dirty he had gotten the inside of the backpack. His fluff had picked up tons of dirt, leaves, dust, twigs, which we brought back inside the house. Cleaning your cat backpack and cat harness or leash gear preserves it longer while allowing you to have fresh, clean gear to use the next time you want to go backpacking with your feline! DON’T Wait Too Long to Go On Another Adventure!! With that being said, don’t wait too long to go on another adventure! Your cat will become more comfortable with frequent use, so don’t let their memories go stale by not using the backpack often enough. From our experience, Yoda’s curiosity and playfulness have spiked since going on backpacking adventures with us. He loves being able to enjoy the comforts of the indoors coupled with invigorating and stimulating outdoor excursions! Congrats! You made it to the end of this article which means you are officially ready to go backpacking with your cat! Thanks so much for reading and please help share this article with fellow feline explorers such as yourself. Next Post Cheapest Way to Ship a Cat & How Much Does It Cost?